Whether recording artists such as Luis Miguel and Macy Gray or mixing 5.1 soundtracks for film, Grammy winner Rafa Sardina chooses LSR28P and LSR25P powered studio monitors from JBL Professional. At the first Latin Grammy Awards in September, 2000, Sardina received two Grammies for Album of the Year and Best Pop Album for his work on Luis Miguel’s “Amarte Es Un Placer” on WEA International. Rafa’s monitors must be versatile and adaptable to a wide variety of styles and types of music. In addition to recording Luis Miguel’s Grammy winning album, he also worked on Miguel’s Grammy-nominated live release “Vivo” using the Sheffield mobile truck on location in Monterrey, Mexico. “Vivo” was produced both as a CD and as a DVD with 5.1 sound and was mixed at the Record Plant using JBL LSR powered monitors. Rafa Sardina began his recording career doing sound for live shows in Spain. 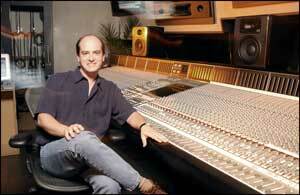 Later he became an assistant engineer at Hollywood’s Ocean Way Recording and Record One studios. During the last five years Rafa’s engineering career has encompassed an eclectic but impressive client list including Macy Gray, Dru Hill, Mariah Carey, Luis Miguel, Juan Gabriel, Sheryl Crow, Soul Coughing, Angie Stone, Siedah Garret and recently with Flamenco pop artist Hector Dona. In addition, Sardina engineers soundtracks and background music for film and television. Early in 2001, he recorded and mixed the music for the HBO Movie “Dancing in September”. The film was mixed in 5.1 using LSR28P recording monitors for its first showing at the prestigious Sundance Film Festival prior to being televised on HBO. He has also recorded and mixed orchestral music for “101 Dalmatians” and “Any Given Sunday” and the IMAX movie “Michael Jordan - To The MAX”. In the tradition of JBL Studio Monitors, the LSR Series features the latest in transducer and system technology combined with breakthroughs in psychoacoustic research to provide more accurate studio reference for recording, engineering and mixing. The LSR (Linear Spatial Reference) line includes the LSR32 three way system and three self-powered models, the LSR28P, compact LSR25P and LSR12P powered subwoofer.